Are you a proud owner of a doggo or a pupper? Are you always trying to get pet hair out of your furniture, couches or the entire home in general? If your answer to any of these questions is “yes”, then you’re in the right place! Here’s all that you need to know about the best dog hair broom products on the market today! Evrilholder’s FURemover broom has been around for quite a long time and has earned a huge name for itself since it came to the market. Many people have been using it for as long as 8 years without any complaint, and this itself should vouch for its great quality! 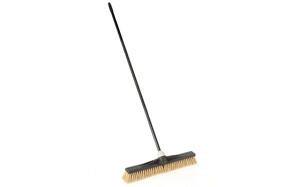 The head of the broom has soft rubber bristles on one side and a wide 12-inch rubber squeegee on the other. The bristles are meant for taking up fur hair from normal surfaces while the squeegee can be used to clean up spills, clean windows or doors, but customers have suggested that using the squeegee for cleaning pet hair is more efficient. The long handle extends from 36 inches to 60 inches, so you don’t have to worry about bending downwards or getting a lander to clean things at a height. 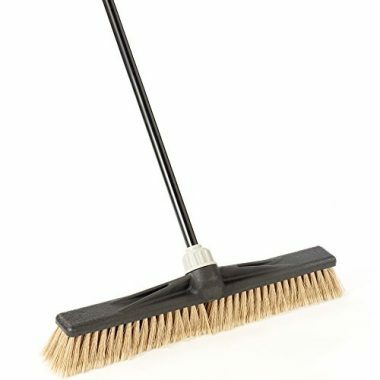 This is definitely a contender for the “best broom for dog hair on hardwood floors” title as customers have reviewed it to work magically well on hardwood surfaces. It is claimed to work on all surfaces by the manufacturer, including carpets, tiled, concrete etc., and we have failed to find one that proves them wrong! 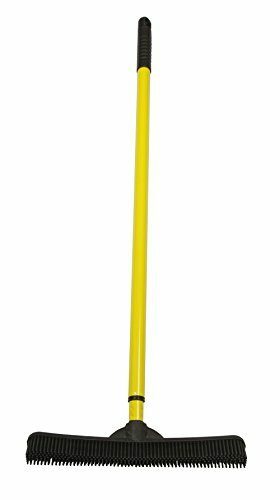 If you want a rubber broom that is lightweight but sturdy at the same time, then you should definitely be looking into this one. Using a fur remover broom can be hard if they are heavy since you will have to use a lot of force for a long time, but using this one is much easier. 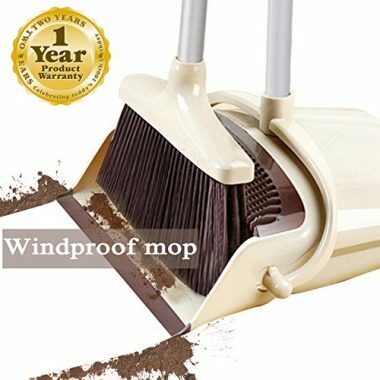 This water-resistant broom attracts hair like a magnet, let it be yours or your pets’. We find it really convenient for storage and maintenance as it stands up on its own and dries really quickly, so all you need to do is hold it under the water when you’re done sweeping and it will automatically be cleaned (no need to get your hands dirty to pull hair and dirt out). The handle of the broom can be used in a length anywhere between 31.5” to 55” which means both kids and tall adults can use it effortlessly. It can be used on any surface and seems to work really well on hardwood floors. Unlike the previous one, the rubber bristles do their job of pulling up hair properly while the squeegee is optimum for cleaning spills or windows. 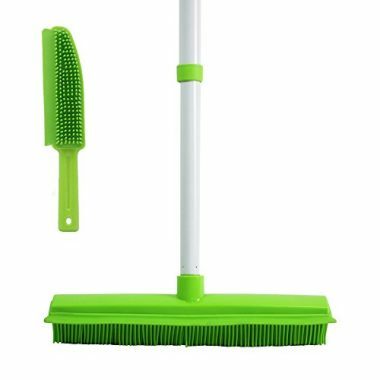 If you have a few dollars to spare for something that will genuinely reduce your hassle in every way possible, then this broom and dustpan set is definitely the one for you. Sweeping can be a really tough task to do if you have kids running around at all times. We’re pretty sure you have had to re-sweep an area multiple times, just because they have run through your pile of dirt and spread it all around again. If you have a dustpan with your broom, this won’t be a problem at all! The rubber lip of the dustpan gets very close to the surface, which means you can sweep tiny particles very easily. 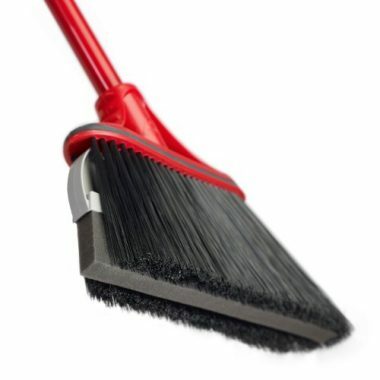 However, the main reason we’ve put it on the list of “best broom for pet hair” is because of the teeth of the dustpan. When you’re done sweeping, all you need to do is pull the broom through the teeth and all the hair and dust sticking to the broom will come right off. 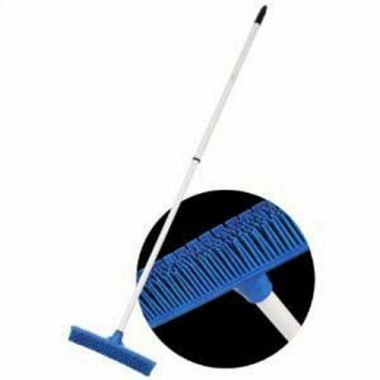 Storing this combo is very easy as both dustpan and broom are retractable, and the angle of the dustpan can be changed too. O-cedar has quite the reputation when it comes to cleaning tools, and they’ve definitely stood up to it with this broom too. Let it be cleaning off your pet fur from the softest of carpets or from the narrowest of corners, this broom will do it all with its extra soft bristles. Many brooms have issues with the head as they tend to get loose and come off. But with O-cedar’s Maxi-Lok® technology and socket designed for anti-rotation, you’ll definitely find it more convenient and less worrying to sweep with. It does not have a squeegee, but is primarily designed for smooth surfaces so you can use it on any surface you want (even rough ones, as customers, have reviewed). The bristles are truly extra soft and will not harm your surfaces in anyway whatsoever. It can be used both for indoors and outdoors purposes and even for commercial purposes. 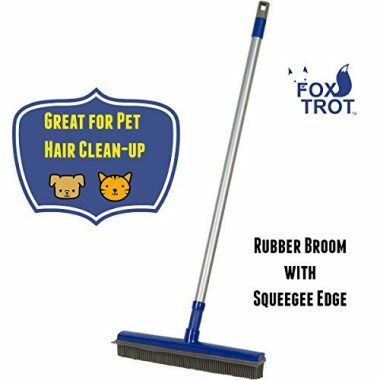 If you want a reliable, specialized rubber broom for pet hair that will also be useful in cleaning other things, this broom is the one you’re looking for. It is suitable for ANY type of surface, let it be indoor or outdoor, dry or wet, hard to reach or way high up, nothing is impossible with this broom. Hundreds of soft rubber bristles ensure that all your pet hair is easily removed from carpets or marbled/tiled/hardwood surfaces. It will not leave marks and nor will it dull the finish. The built-in squeegee makes it useful for cleaning windows or windshields or just cleaning away spilt liquids. The handle is extendable from a default height of 30 inches to 50 inches, so both kids and adults can use it without any trouble. Maintaining the broom is no trouble at all as all you need to do is wash the broom bristles in soapy water to clean it and make it new again. 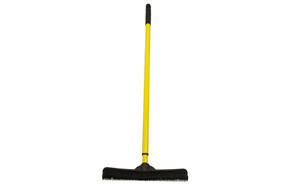 As the name suggests, Ravmag’s sturdy rubber broom comes with a wide built-in squeegee of 13 inches. It is great for wiping liquids as it has great absorption power, and cleaning plain surfaces like windows in one go, therefore customers have reviewed it to be really useful indeed. The highlight of this broom is that it’s incredibly well-made and the plastic used is off really high quality. The handle is fixed at 55” length, so there is no hassle of screwing or locking the handle into place. The broom claims to have “advanced cleaning technology” and it has seen to deliver on its promise of lifting small particles of dust, dirt lint and obviously, any type of hair. It is also a great carpet broom as it is gentle on the carpet and does not damage it while lifting out pet fur. It is water-resistant and has very low maintenance, but all these good qualities come at a very steep price. This broom is quite unique as it comes with an additional small brush ideal for grooming your pet as well as removing fur from hard to reach corners. With that said, the broom also does a great job acting as a wet scrubber. Quite versatile indeed! 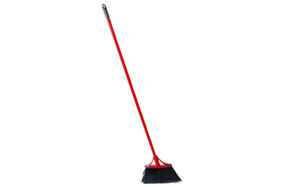 This gloyy broom does a great job as a carpet broom as well. It has an extendable length of 30 inches (perfect for kids) to 47.2 inches (adequate for average sized adults). It electrostatically pulls up dust and pet hair, therefore it is pretty effective. The squeegee is very useful for mopping up spilt fluids. The only downside of this broom is its handle, which tends to slide down sometimes. Customers have said that it needs a better locking system which will keep the handle in place. It is also a tad expensive compared to other similar brooms. Another top contender from O-Cedar is a unique one indeed. It is called a “dual-action” broom as it has a foam blade in between the 2 rows of bristles, which work together to capture dog hair or dirt. The foam blade is removable, therefore it can be cleaned easily. Many customers do not understand the usage or need of the foam blade, while others have said that it actually works well and catches more dirt than usual. On the contrary, many have complained that it falls out while cleaning which can be a hassle. 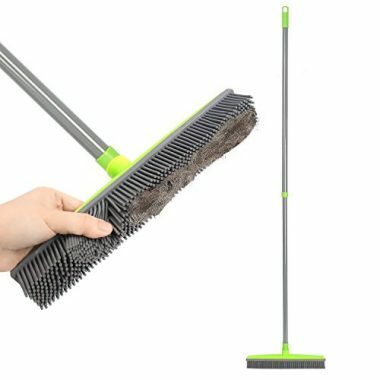 This broom is also cheaper compared to its brother mentioned earlier. As the broom is quite light-weight, using it does not get harder with time compared to other brooms which cannot be used for more than 15 minutes at a stretch (your hands will bark with pain, otherwise). The quality of the bristles is quite good. Now, who wouldn’t want a dishwasher-safe broom head!? We know, most people find it disgusting to clean off their brooms after they are done sweeping, and if you are one of them, then this broom is perfect for you! 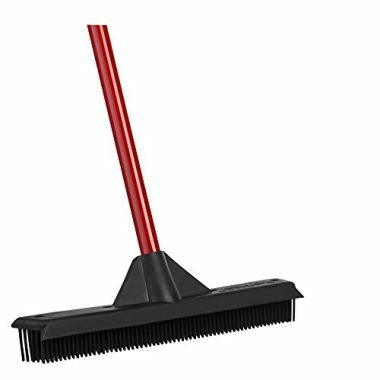 The detachable rubber head of the broom can be easily opened for dishwashing, and the bristles are quite soft which make it ideal for any surface. The bristles are made of a special type of plastic named TPR, which gives them electrostatic capabilities (hence the name “FurStatic”! 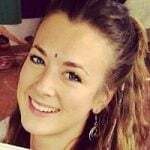 ), therefore they attract hair and tiny particles to them. The telescopic handle can be as short as 29”, which is great for kids, to as long as 51”. We think it’s quite aesthetically pleasing as well, as the combination of blue and white is pretty indeed. What Makes a Good Dog Hair Broom? As simple as it sounds, a good broom is actually one that pulls the hair away with it when it’s done instead of making them float back into the air as most brooms do. Good brooms rarely leave any scratches on hardwood floors, neither will it dull the finish of any surface it is used on. It should also be able to reach weird places where your dog likes to venture. There are SO many advantages of a rubber dog hair broom! Vacuum on a weekly, if possible regular, basis. The more you vacuum, the lesser dirt will accommodate together. If you own a pet, we suggest you to use one of these brooms to comb out and collect all the pet hair first and then use your vacuum cleaner. Mop regularly. If you’re doing it on a regular basis, a damp mop soaked in just plain water should be sufficient, but keep changing the water when it gets cloudy. If extra dirt builds up, use a commercial cleaner. Wipe up any spilled liquid instantly. The more you let it stay on the floor, the more damage it can inflict. Q: Why do I need a great dog hair broom for my floor? A: A good broom ensures that your floors stay safe, do not get scratches and retain their shiny finishes for as long as possible. They also thoroughly clean your floor which prevents allergies or other diseases caused by unhygienic conditions. Q: What types of floors can you use a dog hair broom on? A: Different types of brooms are suitable for different surfaces. Rubber brooms are usually good hardwood, vinyl, concrete, tiled and even carpeted ones. For outdoors, brooms can be used on any type of surface for cleaning big debris or tiny sawdust particles. Q: How often should I use my dog hair broom on my floor? A: In easy words, as often as possible. If you can take five minutes of your day every day to broom your floor, you’ll be using much lesser elbow grease compared to when you broom once a week or month. The more time pet hair gets to accumulate on floors, the harder it gets to remove them. Q: How is a dog hair broom more effective than a vacuum cleaner for pet hair? A: Vacuum cleaners often fail to pull or attract tiny hairs and dust particles, while brooms can effectively pull them out! Out of all the brooms mentioned, the best dog hair broom, in our opinion, has to be Evriholder FURemover Broom with Squeegee. It has the best minimum and maximum length for sweeping, with bristles soft enough for any kind of surface, and is a bang for the buck! The con of the broom is synonymous for most of the models here, so we think it can be avoided if you’re just a bit careful while sweeping.